Mirrored furniture and see-through acrylic furniture (I'm a sucker for ghost chairs!) both give an illusion of extra space because of their reflective and translucent bodies. Use boxes in pretty colors to stow supplies. Dress up the space with pretty patterns in classic black and white, ladylike artwork, and fragrant flowers. You'll have the most lovely place to do homework. 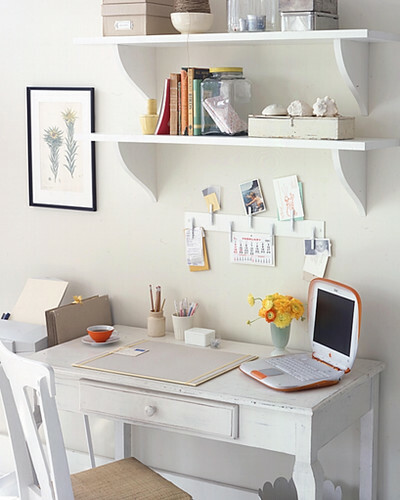 A simple one-drawer desk is great because it offers the simplicity of a table, but a little bit of storage to tuck away clutter. Again, clipboards replace the usual bulletin board. And a cabinet hung over the desk is a great way to store books and extra supplies. Lots of white is always smart in a small space. For a different take, combine different whites: distressed antique white, crisp white, shiny modern white, etc. Keep desk clutter to the minimum. Hang shelves on the wall for vertical storage. And check out the adorable diy-message board made using a strip of wood and clothespins painted white. So simple and so efficient. Combining white with two other colors makes for a vibrant space, especially when those two colors are opposites like light green and bright orange. Gather supplies on a tray. Go big and bold with the lamp. Make sure your chair is comfy and cushioned. And create your own bulletin board by framing it and covering it in a neutral fabric. That has got to be one of the prettiest bulletin boards I've ever seen. I just adore the first picture! Its so me, I would love to have a study like that. I also like the idea of having clip boards instead of a pin board. The clipboards a great idea. On the walls or just to have in general. Kudos on your blog. I tried to start a dorm room design blog and failed miserably. Clipboards are amazing. I love the Liberty of London ones that are available at Target right now---they're soooo pretty! The clipboards are a brilliant idea to avoid paper clutter at home. I will be hiring los angeles document shredding to start to clean up my mess at the office. 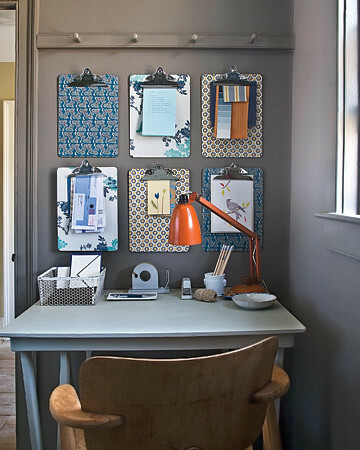 I will try to make this organizer and start hanging clipboards on my wall so as to prevent clutter. Thanks for sharing this by the way. If you have lot's of furniture and don't know where to place them, then I suggest that you rent a storage unit for all of those.